Lifetime Learning’s read for the year is Jan Jaboe Russell’s The Train to Crystal City. This should not be a suggestion or recommendation. It should be a requirement. Every American should be required to read the book. No! Change that to read that The Train to Crystal City shall be on the reading list of every THINKING American and of every American history class in the nation. This is the story of what a country in hysteria, such as ours in the 1940s and now, can and will do to its inhabitants. Before Russell published her book, few Texans knew that their state was the home of the only internment camp for foreign born parents and their American born children who could be used as barter bait for Americans held by the Axis powers. Admission as an internee was earned by some hysterical, envious, aggravated, greedy, or just mean adult whispering to an agent of J. Edgar Hoover, Director of the FBI, that one of his or her neighbors may be more loyal to Germany, Japan, or Italy than to the U.S. Just that whisper was the ticket for the “disloyal” resident and his family, including any American born and educated children, for the train ride to the oven like climate of Crystal City, Texas. 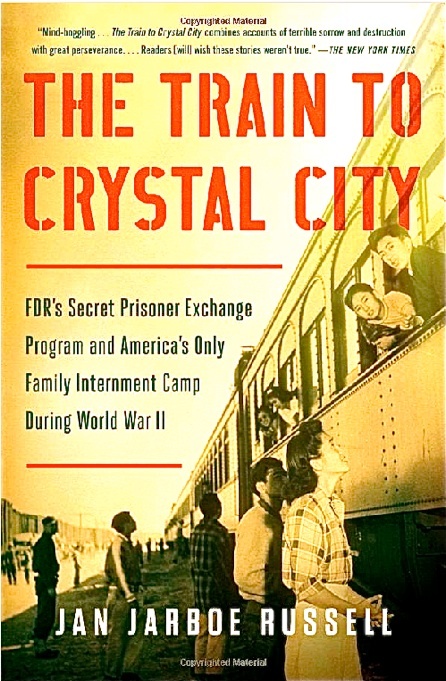 In addition to detailing the history and lore of each family profiled, Russell details the history, politics, and prejudices that permitted and justified the creation of concentration camps in the U.S.
For example, some of the Japanese imprisoned at Crystal City had lived legally in the United States for many years but had not become U.S. citizens because federal law at the time prohibited extending citizenship to Chinese and Japanese. Although citizenship was available for German aliens, the procedure to become naturalized was long and cumbersome with deadlines that could not be missed. If a deadline was missed, the applicant would have to start all over again. Many Germans who had led productive lives in the U.S. for many years, but who had missed a deadline or two, were swept up with their families for internment. Any thinking Americans reading these pages today cannot help but wonder if we are rapidly approaching modern versions of Crystal City. News media of all types are full of reports of someone or some group urging the roundup and deportation of every undocumented individual in this country. The undocumented mother of the U.S. soldier with whom I shared an airline flight several years ago would have to be booted out just like the young man just caught dripping wet as he waded out of the Rio Grand. The Mexican couple who came here 20 years ago for a better life, are gainfully employed, have not had even a speeding ticket, have borne and reared children who know nothing but English and American history must be sent back across the border with or without their children. And, yes there are some undocumented aliens here who have lied, cheated, stolen, and killed, just like a bunch of good old locals. They should be punished as locals, then deported with a warning that if they return and are caught again, they will be confined at hard labor for life. Just like the German, Japanese, and Italian immigrants confined with their American born families in the American concentration camp at Crystal City, the current immigrants now in the country without proper documentation are here with the forbearance of the government. We know they are here, but take no real action to deport them or legalize their status. Regardless of the official excuses in justification, the camp at Crystal City, Texas, is nothing to be proud of. It is, however, a part of our history that cannot and should not be forgotten. So get your copy of The Train to Crystal City and, as you read it, keep thinking, could this history repeat itself in today’s environment of fear and hysteria?